Today I’m glad to introduce you an ANE for Boom Video! Checkout the Github to include videos in your awesome AIR games! Promoting your application, and making it easy to be accessible to everyone is one of the key of its success. Custom url schemes, are one of the best way to do it! On a previous blog post, I explained how you could use them with AIR. I also presented a service, rdrct.it, which allows thanks to a unique link to direct you on the mobile store corresponding to your mobile operating system and even launch the app if it’s already installed! Branch Metrics goes way further (and for free). You have all the options of rdrct.it and you can give parameters to links. In other words, for instance, you can invite your friend to a game you’re playing (via a link generated inside the app) and for example giving him some of your items so he won’t start from scratch! This open the door to many opportunities. Give a try to the Branch Metrics ANE, it has been crafted with love by your humble servant! We’re glad to introduce our first commercial product: an ANE for Google+! We’re big fan of Milkman Games’ ANEs, especially the GoViral one. It enables to share a post on Facebook, Twitter, mail… everywhere? Not really. It’s missing Google+! Thanks to our ANE, you will be able to target the Google+ platform for iOS and Android. Update: The project has been FWA mobile of the day! Note that this blog post was written 3 months before its publication. This new project was kind of special for me, I made an iPad application, Geophysic® with one of the best French agency Soleil Noir for the famous luxary watches Jaeger-LeCoultre. No less! When I was a student, Soleil Noir was the best French agency and we all dreamed to work there! So you could imagine how fun it was to work with them! As a luxury brand, Jaeger-LeCoultre, has a very high expectation of the final product. Combined with Soleil Noir’s graphic designers, it results in a top quality iPad application. RE-Edit : Scaleform mobile SDK 4.4 is out! We’re in 2015 and Flash is still there. It might be a dying technology but it couldn’t die right now because there isn’t any other tool which is able to replace it. The strength of Flash is obviously its vector animations. However since several years many of the flash developers don’t use the Flash Pro software in their daily job. Now we’re mostly using Starling and sometimes we grab animations from a fla and turn them into a SpriteSheets, or using DragonBones or mostly a SWC file to turn it into textures at runtime. Also there is the fact that we’re not able to reload SWF file using AS3 code on iOS. Those facts highlight that something is broken in our production line: graphic/animation designers are increasingly dependent on developers. We are not able to take their SWF to make it running on our mobile device, so we must recreate everything ourselves via code and optimized framework (Starling). And hell, I hate doing animations jobs. I think AAA studios were laughing when Flash was announced dead, because they use it daily. Mass Effect, Tomb Raider, The Witcher, Crysis… all of them use SWF file for their UI stuff. Have you thought a moment that even EA was using SpriteSheets with several resolutions for its menu!? Obviously not, with SWF file they are able to target all resolutions needed with just scaling/stretching their SWF without any loss, from a crappy 640 x 480 resolution to a 4k. However they are not doing it via AIR (it even doesn’t exist on console), but via Scaleform. Let’s have a look on this amazing tool! The iBar program (PC only) works exactly like an iPad, a main screen launching applications. That was the first time that I worked for a museum, and so there were new kinds of problematics: how to know if a touch screen crashed and notify someone? How to get the errors for fixing them later? How to update the application on each touchscreen without human intervention on each machine? Intro : This is a serious game designed to teach players a bit about how water treatment and supply works; specifically how its organized in the Île-de-France region – around paris. The game map is loosely based on that region and divided by areas which corresponds to the master water supply facilities that share connections around the region. The map shows you which levels are accessible to play or re-play, you can zoom it or out with many graphical details. The three areas need to be completed and in order to complete one, you need to connect all buildings together by playing the game levels, and also buy the missing buildings using the coins you collect. This is not a management game however, you do not have to save money or buy things in advance, it is balanced so you can easily get to the end without worrying too much. The action of buying or clicking buildings on the map will tell you more about what these buildings do and how they relate to others… Their in-game worth also gives players a hint on how important they are. The challenge here was to keep the package size as low as possible yet keep the graphics at maximum quality. I’m happy to introduce you a new app: Planète Liège (cork planet) for iOS & Android. The application (in french only) gives lots of information about winemaking. Sometimes making institutional apps reveals many challenges as we will see below. 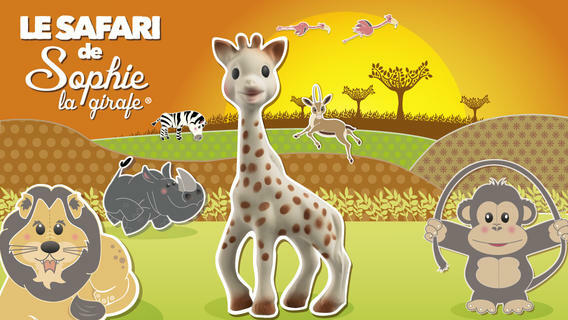 I’m glad to present you a new app with the famous girafe: The Safari of Sophie la Girafe! A fun and educational puzzle game for children between 2 and 6 years old! This adventure contains 18 original puzzles for you to enjoy with your child! Travel to the great plains of Africa with the famous Sophie la Girafe! Introduce your child to lions and giraffes! Soar alongside eagles and pink flamingos and fly over herds of zebra and groups of crocodiles as you explore the mythical world of Sophie la Girafe. All the scenery and environments have been especially designed with your child in mind. Your child will find it easy to move the puzzle pieces around by dragging them on-screen. The howls and roars of the savannah have been used to bring each animal to life. Your child will be captivated by the clear, interactive interface, especially designed for younger children. Thomas, in a previous blog post, related our issues using Adobe AIR GPU mode for a large project & how we switched to Starling. The Safari of Sophie la Girafe, is made with the GPU mode. As usual I made it with the Citrus Engine. Due to the complexity of some animations and finally because of bones/layer number I used DragonBones for running lots of them at full speed. The app works great but you may encounter some performance issue on iPhone4 due to this Adobe’s bug. Hey, I’m glad to share with you that Silly Family is now available on the Mac App Store! Don’t hear anything about Silly Family? Have a look there. Thanks to Adobe AIR technology, with exactly the same code base we released the game on iOS, Mac, Android & Amazon. We could also release it to PC, but not sure where to sell it… I hope AIR would work on Windows 8 modern UI mode and so sell it via Windows store, but that’s an other story. The first time you’re looking for putting your AS3/AIR game on the iOS store, you will find lots of tuts. However for the Mac App Store, that’s an other story. This one is the most concrete that I found. productbuild --component $DIR/"$1".app /Applications $DIR/"$1".pkg --sign "$3"
#sh FromAirToMacAppStore.sh "SillyFamilyDesktop" "3rd Party Mac Developer Application: DaVikingCode (XXXXXXXXXX)" "3rd Party Mac Developer Installer: DaVikingCode (XXXXXXXXXX)"
#!/bin/sh #!/usr/bin/env bash #$ -N $2 DIR="$( cd "$( dirname "$0" )" && pwd )" cp $DIR/Info.plist $DIR/"$1".app/Contents cp $DIR/Icon.icns $DIR/"$1".app/Contents/Resources rm $DIR/"$1".app/Contents/Frameworks/Adobe\ AIR.framework/Versions/Current/Resources/WebKit.dylib rm -rf $DIR/"$1".app/Contents/Frameworks/Adobe\ AIR.framework/Versions/1.0/Resources/AdobeCP15.plugin rm -rf $DIR/"$1".app/Contents/Frameworks/Adobe\ AIR.framework/Versions/1.0/Resources/Flash\ Player.plugin rm -rf $DIR/"$1".app/Contents/Frameworks/Adobe\ AIR.framework/Versions/1.0/Resources/adobecp.plugin chmod -R 777 $DIR/"$1".app/ #codesign -f -v -s "$2" $DIR/"$1".app/Contents/Frameworks/Adobe\ AIR.framework/Versions/1.0/Resources/AdobeCP15.plugin #codesign -f -v -s "$2" $DIR/"$1".app/Contents/Frameworks/Adobe\ AIR.framework/Versions/1.0/Resources/Flash\ Player.plugin #codesign -f -v -s "$2" $DIR/"$1".app/Contents/Frameworks/Adobe\ AIR.framework/Versions/1.0/Resources/adobecp.plugin codesign -f -v -s "$2" $DIR/"$1".app/Contents/Frameworks/Adobe\ AIR.framework/Versions/1.0 codesign -f -v -s "$2" $DIR/"$1".app/Contents/Frameworks/Adobe\ AIR.framework codesign -f -v -s "$2" --entitlements $DIR/entitlements.plist $DIR/"$1".app codesign --display --entitlements - $DIR/"$1".app productbuild --component $DIR/"$1".app /Applications $DIR/"$1".pkg --sign "$3" codesign -v --verify $DIR/"$1".app exit 0 #sh FromAirToMacAppStore.sh "SillyFamilyDesktop" "3rd Party Mac Developer Application: DaVikingCode (XXXXXXXXXX)" "3rd Party Mac Developer Installer: DaVikingCode (XXXXXXXXXX)"
Back for one week at Gobelins’ school! Unity2D the Good, the Bad and the Ugly. GPU render mode hell, and how we barely got out of it alive.